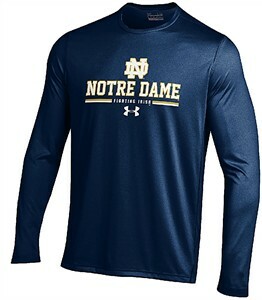 The Notre Dame Fighting Irish Hi-Tech Nu Tech Poly Dry Long Sleeve Shirt by Under Armour has a body made from 100% Recycled polyester that uses a Superior HeatGear moisture transport fabric to help keep you comfortable throughout the day. With a loose fit this Blue T Shirt features ArmourBlock anti-order technology. Lightweight brushed fabric, screening on the upper back neck Under Armour logo, and screening on the full-chest team graphic and Under Armour logo.